When first learning SQL Server, I had the brilliant idea of defining every column on my table as VARCHAR(8000). After all, the VARCHAR datatype only consumes as much storage space as the string itself (plus two bytes), so even if I defined the max length of a column as 8000, I wouldn’t be wasting storage space if my data was smaller than that. My development life would be easier too since I wouldn’t have to think about the kind of data I was storing in my columns; I could define everything as VARCHAR(8000) once and never have to go back to make any changes. Brilliant! While I was correct about not wasting storage space, it turns out the idea of making every column VARCHAR(8000) is a terrible idea. What follows is a (partial) list of reasons to avoid defining every column in your table as VARCHAR(8000). When columns are defined accurately with specific data types and lengths, they help provide understanding about the data they contain. We can’t be 100% confident about our assumptions until we verify them by profiling the data itself, but a lot of times having decent guesses is good enough. Your application (hopefully) has some good client and server side validation built in. Those validations don’t always work so it never hurts to have some extra validation on the database side of things as well. Imagine the zip code field is directly next to the “Delivery Instructions” box on our app’s “Shipping Details” page. It’s not a stretch to think that a user will someday accidentally type in the special delivery instructions (“Please leave the package behind the house next to the giant pineapple bush”) into the zip code field instead of the instructions field. If your ZipCode field is defined as VARCHAR(8000), that set of delivery instructions will make its way into the database in the completely wrong column. Have fun cleaning up that dirty data. If instead the field was correctly defined as ZipCode VARCHAR(10), the insert would fail and you would prevent that erroneous data from entering your database. Ever try to index a column (or set of columns) that total more than 1700 bytes (or 900 bytes in older versions)? Of course there are some tricks you can use to index those wide key combinations, but you don’t want to use those unless you absolutely have to. 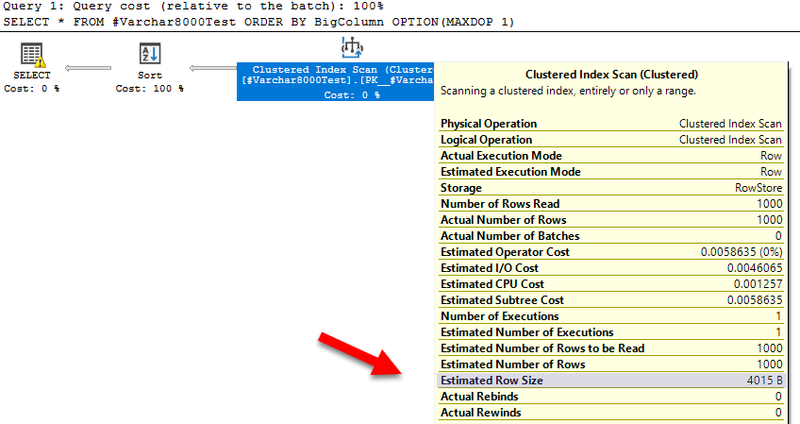 SQL Server estimates that each row is ~4 KB! This is because SQL Server doesn’t sample the data to estimate the average row size for VARCHAR columns, it uses half of the defined length. Fitting this whole table into memory should only take about ~7 KB (3 KB for our BigColumn data), but SQL Server reserves significantly more than that. In this example an excess of 6 MB isn’t a huge deal, but if you are working with a table with many more rows, those excessive memory grants can use up hundreds of megabytes or even gigabytes of memory unnecessarily. 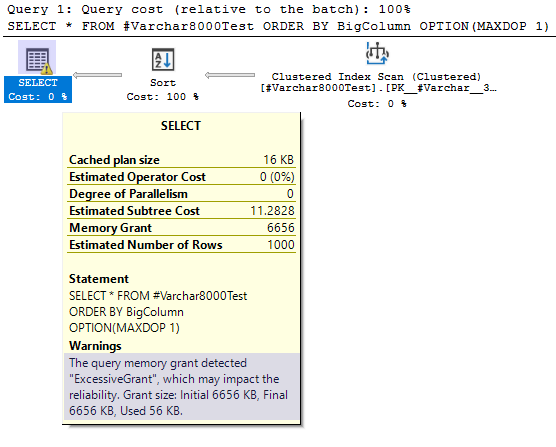 This list is only a start: there are plenty of additional reasons why defining every column on your table as VARCHAR(8000). My goal with this post wasn’t to create a comprehensive list, but rather to provide enough compelling reasons to have dissuaded my novice self a few years ago from even considering this as an option.